My mother is no joke. She is a force to reckon with any day. But if you really want to lose a showdown, pick a fight with her in the kitchen. She will show you how bread is buttered and then some. Guaranteed. 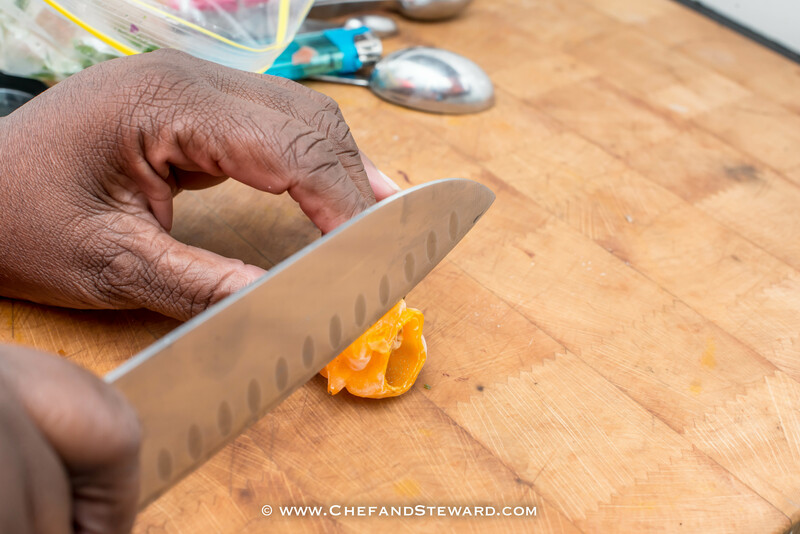 When she came to visit us in the UAE, she bravely took her palate to places it had not gone before, but as soon as she came back inside our home, her taste reverted to our Jamaican island flavours. It was her longest trip away from home and she missed it. I do not recall how I got her to cook the quinoa. “It’s like rice, but healthier. It’s an old seed from Central America. It’s high in protein and its supposed to be really good for you. But it has a funny aftertaste,” I pleaded. Wait! My memory is now flooding back to me… I remember exactly how I got my mother to cook quinoa. She had fancied some steamed fish head with Jamaican Turned Cornmeal (a popular rustic version of polenta). Only we did not have cornmeal because it was only available at Spinneys and I was still banned from driving after my surgery. So we searched the cupboards. And then I saw the bag of quinoa. Ding, ding, ding, ding. ding! A bell sounded in my head. “Why don’t you substitute the quinoa for cornmeal?” I asked. 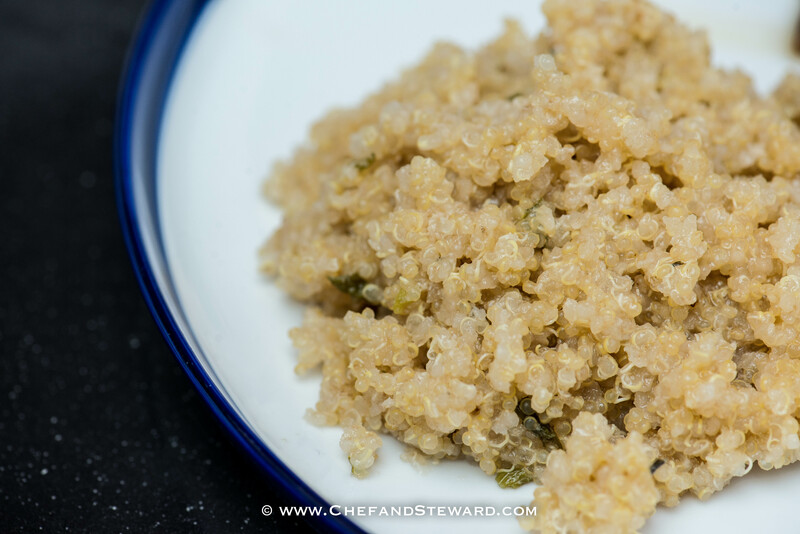 “If it’s good I will blog about the recipe because the world could certainly use better tasting quinoa.” And I promise you world, you will have better tasting quinoa with this recipe from my dear mother. In a medium saucepan, bring the coconut milk to boil. Add thyme, scallion, scotch bonnet pepper and salt. If you want to know how much pepper, she sliced of about that much. taking care to not include any seed in our little slice. 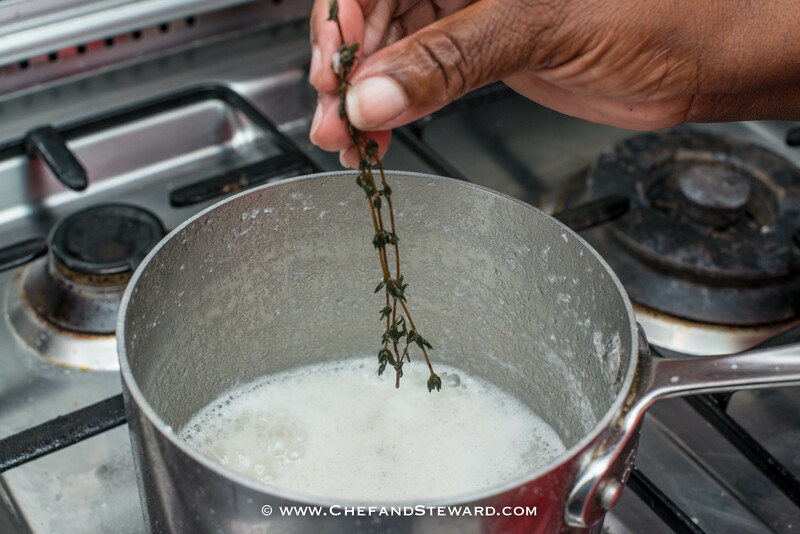 Rinse quinoa then add to bubbling coconut milk. Taste and adjust salt if necessary. 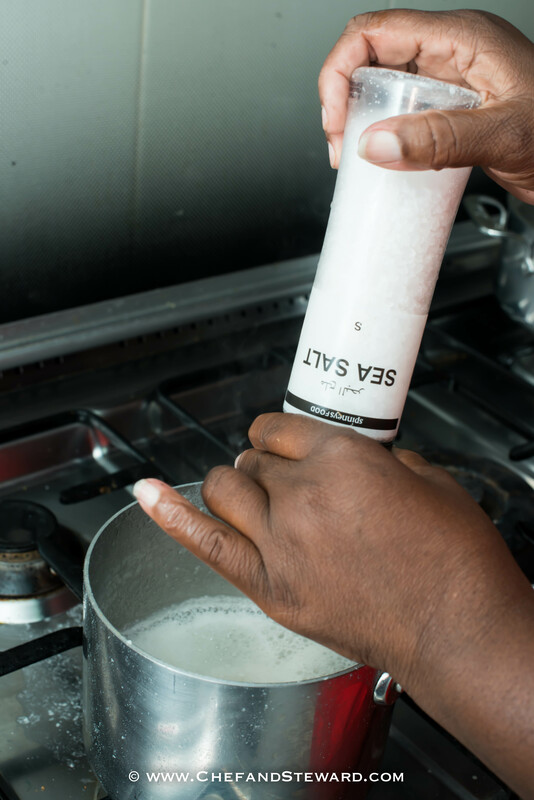 Reduce heat, cover and simmer until coconut milk has evaporated and quinoa is soft to the bite. And voila! 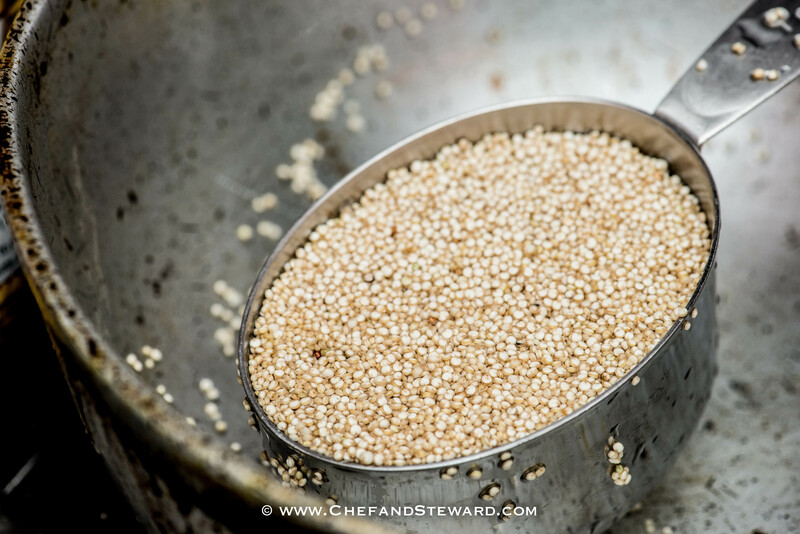 Fluff up your cooked quinoa and you will yield 3 cups cooked from the 1 cup you put in, providing 6 servings of 1/2 cup each. How’s that for stretching food? 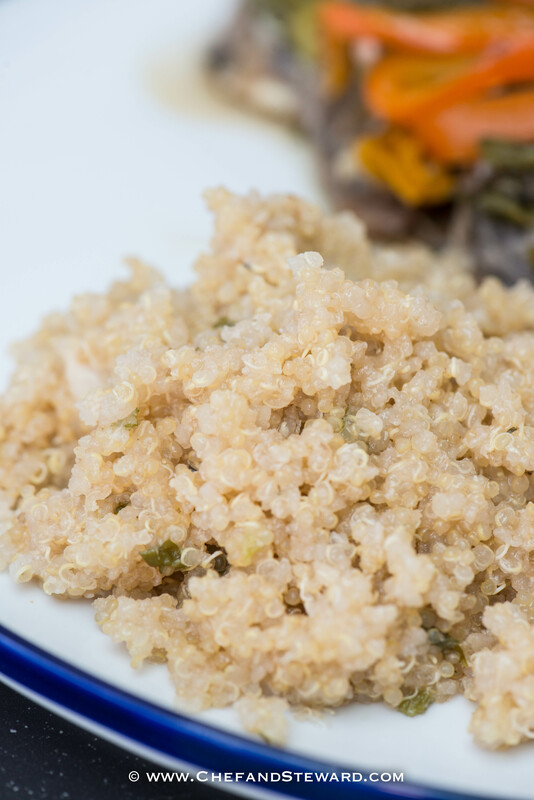 After eating this, you will never have to deal with the odd quinoa after taste ever again! STEWARDS’S NOTE: Join us next for the other half of this wonderful meal tomorrow, the, Spicy Jamaican Steamed Fish Heads. I have been battling to solve the issue of the quinoa aftertaste too. I tried adding all the aromatic spices to it – cardamom, cloves, cinnamon sticks what have you, to no avail. Voila, now your mom has come to our rescue! God bless your mother’s culinary skills! I think this is brilliant! For some reason, I keep buying quinoa, but I never cook it because it just seems like such a pain to flavor it right. I will definitely try out this method. I think this is my favourite way so far. This is the 2nd post I’ve see today on quinoa. The first was quinoa fritters. Have some sitting in the pantry forever. It’s time I tried something with it! And now continues the kitchen experimentation! 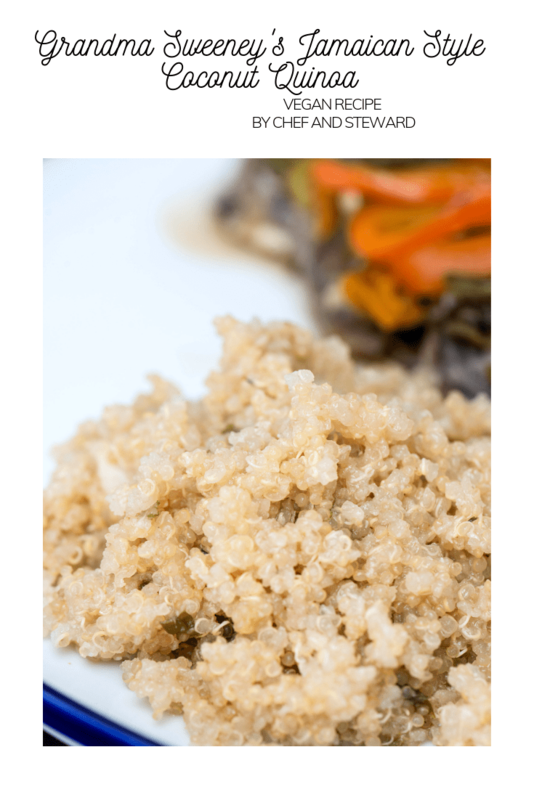 Quinoa -Is it available in Jamaica? I would love to substitute it for rice! Yes it is! Just try the supermarkets or better yet, the health food store. We will bring you some as well when we visit. this recipe looks like its will be worth a shot.. the pictures make it look delicious..!